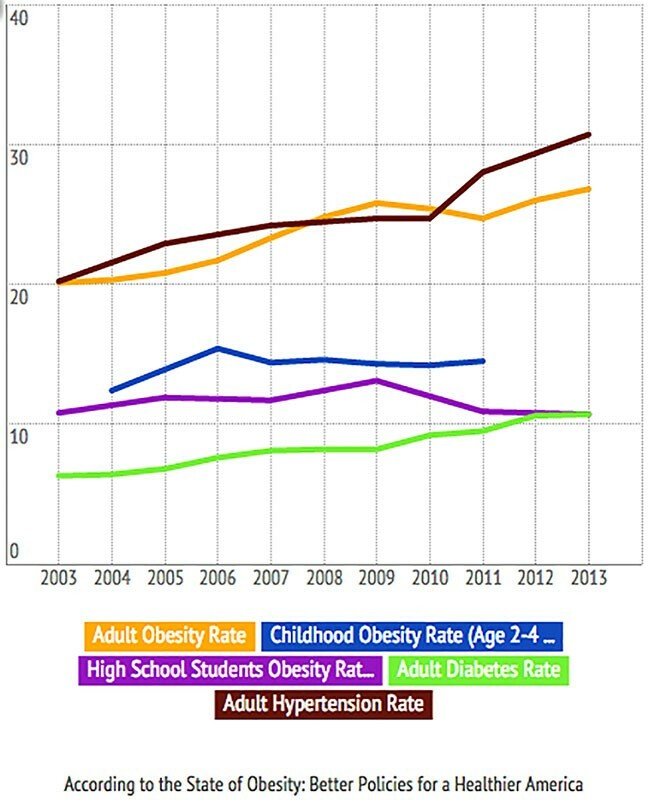 Obesity rates and obesity-related health conditions in Arizona in 2013, according to a new report, "The State of Obesity." • The adult obesity rate was 26.8 percent. • The obesity rate for high school students was 10.7 percent. • Arizona ranked 7th in the nation for obesity among 10- to 17-year-olds, at 19.8 percent. • The adult diabetes rate was 10.7 percent, 15th in the nation. • The adult hypertension rate was 30.7 percent, 32nd in the nation. WASHINGTON – Obesity rates among Arizona adults appear to have stabilized, after rising almost 7 percent over the past 10 years, according to a report released Thursday. The annual report from the Trust for America’s Health and the Robert Wood Johnson Foundation said 26.8 percent of Arizona adults were obese in 2013, only slightly higher than the previous year’s 26 percent. It ranked Arizona 34th among states for obesity last year. Arizona mirrored the nation, where most states were relatively unchanged after years of increases, and only six states showed significant growth in their obesity rates. Both she and the report cited stark differences in obesity rates for minorities, with black and Latino adults in Arizona posting average obesity rates of 33 percent, compared to 22 percent for whites in 2013. While Williams said there are a number of complex reasons why some groups have higher obesity, she noted that they tend to live in low-income neighborhoods and are stuck eating cheaper, unhealthy food. Many of those neighborhoods are likely not as safe to walk in, which could contribute to a sedentary lifestyle and obesity, she said. The long-term trend, for the state and nation, has been bleak. Not one state had an obesity rate higher than 15 percent of its population 30 years ago, the report said. There is not one specific cause for the national increase of obesity in the last 10 years, said Jeff Levi, the executive director of the Trust for America’s Health. But he said the rise in fast-food consumption and low levels of physical activity have greatly contributed to the growth. 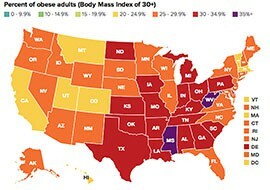 Mississippi and West Virginia tied for the highest rate of adult obesity in the country last year at 35.1 percent of their respective adult populations, while Colorado, for the 24th year in a row, had the lowest rate at 20.7 percent. Among the recommendations Levi mentioned during a conference call to release the report were calls for states to increase education in schools about healthy eating and to expand access to healthy foods for families at local supermarkets and farmers’ markets. Sheila Sjolander, assistant director for the Division of Public Health Prevention Services at the Arizona Department of Health Services, said there are already positive moves being made in the state. Different communities across the state are trying different things, she said. For example, Phoenix officials decided to include healthy initiatives in the city’s general comprehensive development plan in 2013, the first time health was a factor in those plans, Sjolander said. One federal program that Sjolander says has worked is the Women, Infants and Children program, which helps low-income pregnant women with health-care referrals, nutrition education and healthy food baskets. 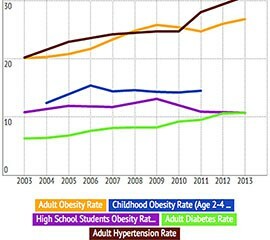 After years of rising steadily, the adult obesity rate in Arizona started to level off in 2013, but rates for children and minority groups remained stubbornly high, according to a new report. Arizona's adult obesity rate of 26.8 percent in 2013, was up only slightly from the year before, and ranked Arizona 34th among states in terms of obesity rates.